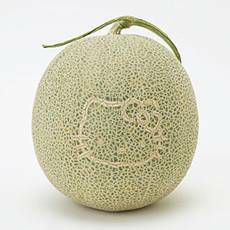 > … a melon with Hello Kitty carved …. Was the HK face carved? I’m suspecting that they placed a pttern on the surface to encourage the pattern to grow, or something. 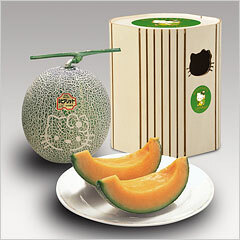 It is too much work to carve HK face onto every melons (Cantaloupe). Psh, I would have totally bypassed seeing the hellokitty face, and tore into the cantaloupe and devouraded it. BUT seeing it at the store the only thing i would notice is the price, I mean $55!?! That’s outragous!!!!! I’d see the price, and be all like, “$55 cantaloupe!!?! Screw that!” I wouldn’t even look at the cantaloupe. And you know when you’re wife finds a local supplier she’s going to have to buy one every week until she finds some way to preserve one so it looks perfect and doesn’t rot. How did they do that? Is it actually branded into the side with a hot iron, like a cow? These are probably special Yubari melons grown in limited quantities for prestige gift-giving, to bosses etc.. They are carefully tended for a perfect appearance and, when harvested, air-freighted from Hokkaido and packaged in classy-looking boxes. Not the sort of thing you’d buy at the local grocery store for your own family. The region they are grown in has had economic tough times since the coal mines closed, so you can understand why they’d be desperate enough to put Hello Kitty on their melons. I did not consciously intend for the last sentence in my post above to sound perverted. It just turned out that way. – A Hello Kittie addict. Sorry this is wayyyy too much for any friut period, although it sure does look really cute! Yeah, that’s not really so expensive compared to Japan’s black and square watermelon fetish, which can cost you a hundred bucks per each. @Liz yes liz fruitbaskets! But in japan watermelon is usually given as a gift and is very expensive, so yeah its just like that, its silly I never connected that.. I was like I get its an expensive fruit(watermelon) and I get its mostly given as a gift but WHY? Fruitbasket! That makes sense now… wow.. why didn’t they use a watermelon its redishpinkish on the inside…. Lol! That’s an insane price for fruit but it’s so cute! Haha. Perfect logic. How to turn the inside pink. Use a different fruit, like a watermelon…. 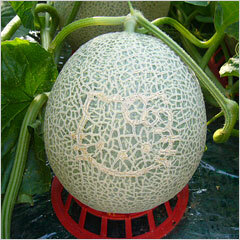 and instead of buying the fruit for $55, just make a stencil and stick it on the melon.